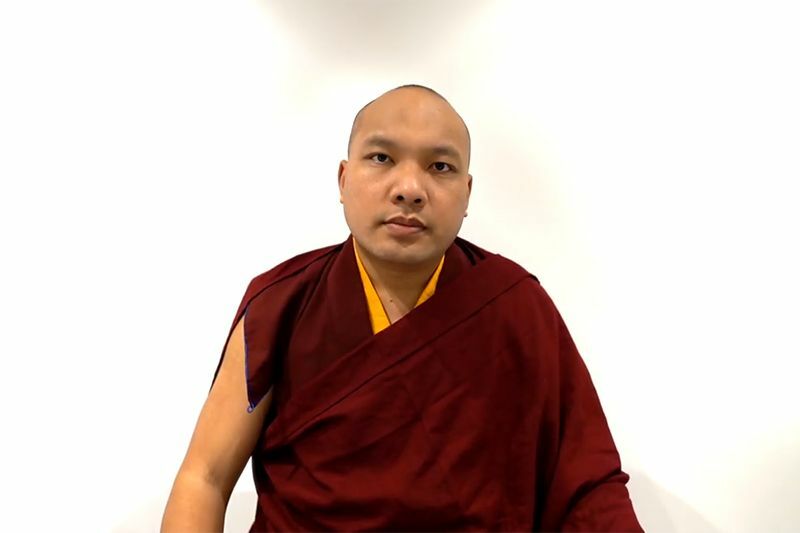 Notation: The ‘[HHK]’ at the beginning of a paragraph indicates that it is His Holiness the Karmapa’s own words in English. 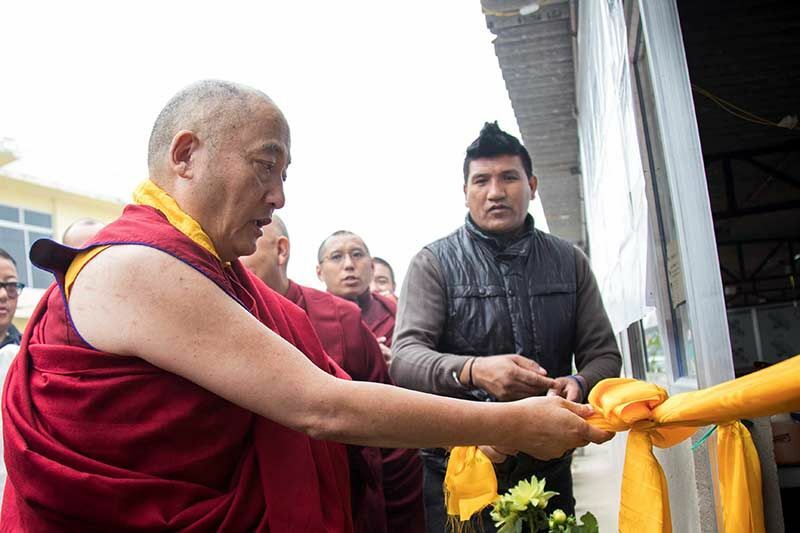 We have been given the opportunity at this occasion of the Kagyu Monlam, as organized by the Kagyu Monlam planning committee, to offer some teachings specifically for Westerners. [HHK] I’m very happy. I’m very happy to see that so many people have come. For the next few days I’m going to talk about “Living the Dharma”. Maybe I’m a little bit busy (pointing up). I don’t know. 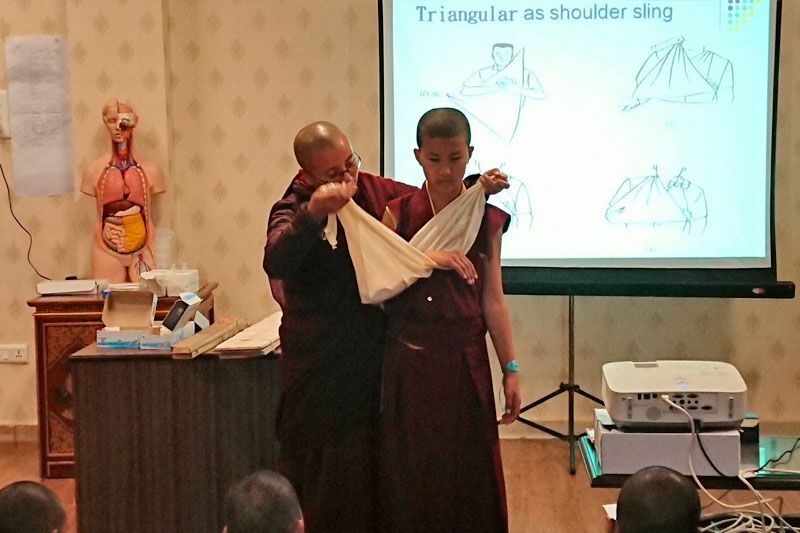 This is the first time I have given a teaching in India, especially for Westerners. 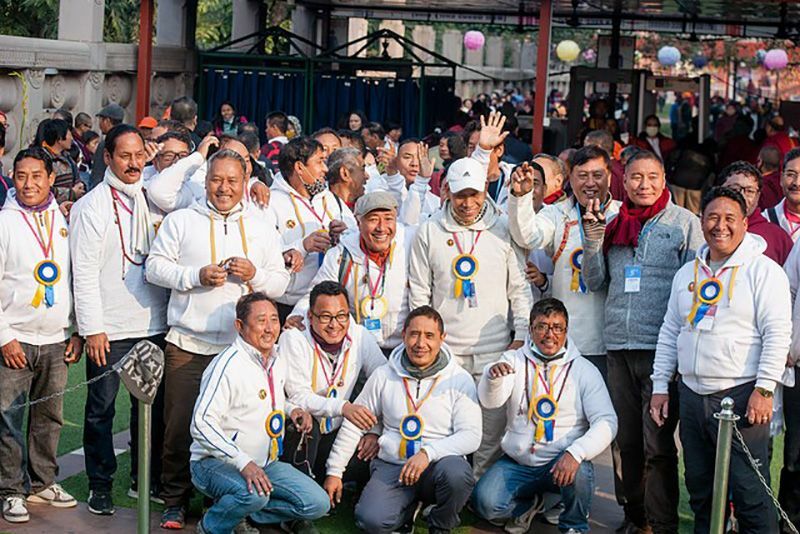 [HHK] So, you have the opportunity to see Bihar, and visit the holy place of Buddhism. Over the last few days, I have been a little busy. And then some of you suggested I speak in English, but I don’t think my English is good enough yet. I have begun to teach in English at Gyuto Monastery this year. Just a little bit. Perhaps this is my preparation for visiting Western countries. For the last few days, I have been busy with the Kagyu Monlam. I’m a little tired so I will retire from speaking English this morning. Maybe this afternoon, tomorrow, or other days I might be able to speak more in English. Today, many people have gathered from many different countries, all over the world. We all have the opportunity to be here. Friends have come from different countries, with different environments, different ways of life, and different situations. We have all come here to this place to discuss “Living the Dharma”: how to live in accordance with the Dharma in different environments and in different situations. I would like to discuss with you my own experience on how to live according to the Dharma. However, as you know, I am still quite young. I do not know whether I have enough experience to guide you, but I will try to discuss this during these teachings. To begin with, what is Dharma? Generally, when most people try to practice Dharma, or say that they practice Dharma, they sometimes understand it as a ritual, something that you do with your body, your speech, or through special actions or activities. And if that is the case, then you need to devote special time for that activity. This type of Dharma practice usually happens in your shrine room or in your meditation room. You need to reserve special time for this manner of practice. However, if you look deeply, the Dharma is not only that. Dharma is not a ritual; it is not something you do only with your body and speech. Dharma is actually something that transforms your mind. For example, if we are aggressive or angry, then we may look inside and try to find reasons why we should not feel that way. We instruct ourselves, we try to change it, and then slowly, we become less angry. Or, if we are somebody with a lot of attachment or clinging, we may try to do something about it. We look inside, correct ourselves, transform ourselves from within, and then start to lessen that emotion. That is what we actually mean by Dharma practice. You do not need to find special time for this kind of Dharma practice. You can do this form of practice even while you engage in your profession, your work. It can be done in concert with your daily livelihood. It involves reflecting on your aspirations, your way of thinking, and how you act and react. When you can change that, along with how you relate to other people – through your reactions and connections - you become aware of what you are doing. Examining that and then working in this way is, I think, a very important kind of Dharma practice. In my life, I feel that I am becoming increasingly busy. I feel that the time I have for sadhana practices and meditation is steadily decreasing. These days, I meet many people and I try to help them. My practice generally revolves around my way of thinking and how I actually live my life. I try to live my life with the intention of benefiting other beings. I look at my mind and my intentions, and see whether or not my priority is the happiness of others. At this time, that is essentially my main practice. When I was young, I spent a lot of time reciting prayers and doing meditation both morning and evening. Each time, I would spend about one hour on these prayers. However, these days, I meet many people with whom I make loving connections. Therefore, when I am awake, when I am eating, or even when I am asleep, I think about the people who I meet. These people appear in front of me, whether close to me or within my mind, and so I feel that I am not separated from them. Therefore, I feel that my practice, “living the dharma”, is more vibrant and filled with direct feelings. It is not like simply doing prayers, where one does not have living people to connect with. Then it more or less becomes an aspiration, a general prayer. But the practice I do nowadays has become alive and real, because I’m directly dealing with people who are actually there and with whom I have a relationship. I have not caught a cold yet. It is fine if I do get a cold but it has not happened so far. When I was young, I had to attend to my many studies. I was often so tired that I wished I would become ill. It is said that, in Tibet, when somebody becomes ill, the doctor will usually check their urine and their pulse. Once a lama who was feigning illness put some soy sauce in his urine and sent it to the doctor. I have yet to do that. We come from many different countries of the world, and live in many different societies and environments. But the main thing is that we think about other beings. The most important thing is to keep all other beings in our focus and in our minds, maintaining a vivid connection. We must not forget sentient beings. If we do forget them, we become distracted, or we lose contact with the people that we wish to benefit. Then our laziness takes over. Therefore, I think it is very important that we keep other beings in our minds and are aware of them in front of our eyes. It is important that we not disregard them. As Mahayana practitioners, our main focus is not to give up on sentient beings. Therefore, if we can keep sentient beings always within our minds, within our focus, we have discovered the essential foundation. If, in our minds, we can bring to being the happiness and suffering of many people, that will then help us to transform ourselves. Otherwise, if we just have concern for ourselves alone, there is no need to change. If one is alone and free, then there is no need to do anything. We may even feel that if we change, then we will disappear, or something bad will happen to us. However, if we think about many people, think about their happiness and their problems, and if we maintain a certain feeling of responsibility or concern about their welfare, then there arises a strong inclination, a strong desire to change ourselves. As there are many people, there are many different kinds of problems. Both happiness and unhappiness abound. When my concern is drawn to them, that image comes to my mind, the acknowledgment of the importance of other people. When concern for my own welfare and self-interest begins to diminish, my way of seeing, of being, becomes transformed. Therefore, an essential part of the practice is to keep in mind other people and to experience them either face to face or simply within the mind. With that, we can lessen self-cherishing, our habit of merely looking out for our own self-interest. This kind of loving kindness and compassion toward all sentient beings is like a wish fulfilling gem. When we have one thing that is most important, then we do not have doubt; we do not have to decide what the most important thing is. When we keep that focus, it becomes easier to give up what needs to be given up, and also to apply the antidote to our mind’s poisons. Generally, it is very difficult to work with our mind’s poisons. We are reluctant to give up the control of our negative emotions. We may roughly understand the problems and the disadvantages of kleshas, but we do not deeply see that it is something we need to be rid of completely. We have to see it as something completely negative. That is difficult. I’ll give you an example. People have many relationships, whether with men or women. Sometimes you don’t know whether you want to go with this person or that person, or maybe this is right, maybe this is not right. We are always a little bit confused. We remain filled with doubts and indecisiveness. But once you really fall in love with somebody, then all the doubts are cleared. All of those relationships you have had before become part of the past. You have decided that this is the person you love and want to spend your life with. This helps you to focus your life on something. Dedication to bodhicitta is the same. It is like a wish-fulfilling gem. And when you have that, when you are working for the benefit of all sentient beings, then your heart becomes full of joy. There is no uncertainty. You have completely decided and your purpose is clear. Therefore, as long as we do not find that wish fulfilling gem in our hearts, we will always have some doubt. What is good or not good to do? Which is better? Our mind becomes uncertain and we come upon problems and indecision. But once we possess bodhicitta, the wish-fulfilling gem, then our lives’ purpose becomes very clear and Dharma practice becomes easy. Generally, there is a similarity between what we call Dharma practice and how to live our lives in a proper way. In our ordinary lives, separate from the Dharma, if we have many doubts and much confusion, our purpose or our objective is not very clear. If we do not have a clear stance and focus, then we find ourselves lost in confusion, concerns, and thoughts. In this way, life does not go very well. Dharma practice is similar. First, we must have a very clear understanding. Our purpose, our objective, our view, our stand – we need to understand these unambiguously. Then our Dharma practice can become clear and easy. Otherwise our practice, mired in thoughts, becomes not Dharma practice at all, but rather a religion. It becomes a system. And when this happens, many things come with it: gods, ghosts, good, bad, different kinds of dogma, and other various occurrences. With this, the real practice is lost. In the application of Dharma, there are also views and concepts to a degree, but when we really apply the Dharma in our lives, it is unnecessary to understand much of the philosophy and such. It is certainly good if we understand them, but if we don’t, that is also fine. The main thing is to work for the benefit of beings. And when that happens, we are applying the Dharma to our lives. Many people who come to me ask, “How should I practice? Which diety or yidam should I practice?” I usually respond that they should probably practice Cherenzig – Avalokiteshvara - or Tara. However, it is difficult to understand Cherenzig and Tara and so they get confused. “Which kind of Cherenzig? The one with 2 arms, 4 arms or a thousand arms?” You know, a thousand arms – shaking all of those hands can be a bit difficult. When you do not understand the true meaning of Chenrezig, which is loving kindness and compassion, then you do not understand the relationship between the yidam and yourself. Therefore, because the yidams or the deities are not like lamas who you can visit and talk with, you may feel they are things that come out of the sky. When there is no basis for the understanding of practices like bodhicitta and emptiness and so forth, the practice becomes more or less like blind faith. It does not constitute “living the Dharma”. However, if we bring the Dharma and all of its experiences into our lives, then it is a little difficult, especially for those of us who are beginners. In our lives, we have many problems. We also have certain empty spaces in our lives. That is where the Dharma needs to be applied. We need to use the Dharma to work on these difficulties and to find solutions. We can use it to fill these empty holes or voids in our lives through spiritual practice. If we can do that, then the Dharma and life become one. I believe there is a difference between simply transporting the Dharma into your life and using your problems as a means of incorporating the Dharma into your life. You can use the Dharma to work on your life, which is the most important thing. For example, many people have led a good life, with harmony in their families and so on. But then, they enter into the Dharma. Not understanding things clearly, they then bring many changes to their lives. For instance, in our practice we use vajras, bells, purbahs and various other things. When such things are brought into the home, other family members may become a little uneasy. Sometimes disharmony is created within the family because we do strange things in our attempt to bring the Dharma into our lives. I do not think that is the right way to do it. As life is the most important thing, we have to find the problems in our lives and then work towards them. We must try to understand the Dharma and use those understandings to fill the voids, whatever problems are in our lives. We do not need to change too much in terms of how we are living our lives or our relationships with our families and friends. Nevertheless, we do end up becoming better people. For beginners, I believe the most important thing is to directly use the problems in your life as an opportunity to contemplate the Dharma. You should think: when in difficult times, how can the Dharma benefit me? When you infuse even the smallest opportunity with the Dharma and use the Dharma to solve that problem, gradually you can live your whole life in accordance with the Dharma. Only then can you balance your life and the Dharma. Otherwise, without having this understanding, you will create turmoil in your life just as the people in the example I gave previously did by forcefully bringing the Dharma into their lives. If we live with the intention of being useful and helpful to others, we can understand the Dharma better. We live the life of the Dharma in this way. Then gradually, as our connection with and practice of the Dharma strengthens, as we bring the Dharma into our lives, slowly, our lives become the Dharma. In so doing, we can bring more balance into our lives. We do not need to disturb the harmony, thus creating imbalance. However, we can use the Dharma in a very beneficial way. The Dharma, in general, is used to transform our minds, transform our personality or way of being. We are changing or transforming into something positive, ourselves. To accomplish this, we need instructions. Generally it is said that we must receive these proper and profound instructions from a genuine lama. But then, it is not always easy to find a genuine master. Sometimes, we feel that we have found a genuine master only to discover that is not the case. Therefore, it is not easy to find a genuine master. The masters or the teachers from whom you have received instructions can be of two kinds. There is one kind of master or teacher who genuinely practices the Dharma, and has direct experience with the Dharma. These are the ones you can truly rely on, the ones to whom you can go for refuge. But then there are others who are not like that, but from whom you can receive teachings. From them, you can understand the Dharma. Both are important. Even if you cannot find the kind of teacher or master who you can completely rely on and take refuge in, you may still find people with whom you can study the Dharma. Through that, you can increase your understanding of the Dharma. This is also very beneficial and important. These teachers I refer to are the human beings, the masters who are actual living beings. However, all masters and teachers do not need to be living human beings. Sometimes, as it is said, everything that appears can be a Dharma, can be a teacher or a lama. In mind training, it is said that a negative happening, a negative incident, can be our teacher also. For instance, look at the four seasons: summer, winter, spring, and autumn. If we simply look at it in the usual sense, we think, “Oh now it is winter, we need more clothes” or “Now it is summer and it is hot”. But if we look deeply, we can see that it is continuously changing, everything is continuously changing. The winter is the disappearance of warmth and all the different kinds of growth. Summer turns into winter and so on. When we look deeply, we can understand impermanence from the seasons. And that itself is a teaching. Therefore, if we look deeply at life, we can discover many instructions, living teachings. When we speak of listening to the teachings, though, it is not necessary to hear in words. What we see or feel can also instruct us. There are many different ways of learning and understanding the Dharma. It is not necessary to learn solely through hearing. So that is all for this morning. We will meet again at 3 o'clock. Last year, we talked about environmental protection and now we have brought a booklet in English and Chinese that outlines some environmental guidelines. If anyone wants one, you can buy it in the shop behind the temple. This morning I spoke about formal practice and the way to integrate the Dharma into our lives. I was not saying that you should abandon formal practice, retreats and meditation. I was answering a question many people have asked who have come to see me. They seem to have a substantial amount of work to do. Therefore, they do not have much time to meditate and do formal practices. They are so overwhelmed with work, so exhausted, that they do not have any remaining energy to perform those activities. For that reason, it is not absolutely necessary that you practice Dharma by doing the formal practice. I was also not claiming that lamas are meditators, that we do proper practice and the rest of you cannot achieve this. So therefore, I thought this afternoon I would talk about how we can integrate the formal practice into our lives. Generally speaking, Dharma practice is not merely something that must be done in monasteries, temples, in retreat or even in your own room. It is something that you can do anywhere: in the office, or in places of leisure, like a picnic. It can even be performed in prisons. Once you truly grasp the essence of Dharma practice, you can practice anyplace and in any situation. As some great Dharma masters have said, you can even practice Dharma in your sleep, if you know how to do it. Our life is spent half awake and half asleep, so if we can accomplish useful things while sleeping, that is very good. That kind of a practice, though, is not meant to completely replace all formal practice. We have to do some formal practice. For instance, when you get up in the morning, you should go to your shrine room, if you have one. If you do not, then maybe you have someplace quiet to sit. When you go there, sit down and relax your mind for a while - think about the qualities and the teachings of your lama; think about refuge. If you are engaged in some formal practice, recitations or such, do that. Then relax your mind a bit. Next, you should make a clear and strong aspiration for the day, saying, “Today. I will do something that is beneficial and helpful to people. Even if I cannot do something good, at least I will try not to do anything harmful.” It is important to make that kind of strong aspiration. If you do that, then most likely the day will become useful and auspicious. Then when you arrive in the office or wherever your workplace may be, sit in your chair or anyplace you can find and allow your mind again to relax a bit. Generally, once we leave our homes and set out to work, our mind is thrown into turmoil on the way. As a consequence, our mind experiences agitation and lack of peace throughout the day. So, upon arriving to work, take some time to regain that peaceful mind with which you left your house. I was going to say relax for five minutes, but I think five minutes may be a bit too long. Your boss might say, “What are you doing? You’re not doing any work?” Maybe one or two minutes is more reasonable. During that time, think that whatever work you are doing must be something that is needed for and useful to society. Make the aspiration or commitment to carry out your work in a positive way, one that will be useful and beneficial. If you do this with a genuine motivation, then the work you perform can also become a practice of giving, a form of generosity. In the same way, when you’ve finished your work and you come home to your family and your children (if you have any), you want to take care of them in a loving way. You want to bring your children up in such a way that they will be useful to the world, now and in the future. Raising your children, then, also becomes the practice of Dharma. It is not that you must bring the children into the Dharma for it to be considered Dharma practice. To bring up your children in a way that would be beneficial to the world, to make that aspiration and sincerely work towards it, is itself a truly noble practice. In summary, before you take care of children, or before you start out your work, taking some time to quiet yourself is extremely important. Or we can say this is a kind of formal practice. This is very important. You need to take a moment to purposefully or deliberately think about the aspiration for the task because it does not just happen by itself. We need o make a deliberate effort to see, feel, and think in this way. It is important, especially for beginners, to deliberately think, make our aspirations and try to turn our minds toward that aspiration before you start out any tasks. That becomes a very important step in formalizing our practicing. In a similar way a loving relationship between husband and wife can also become a catalyst for our Dharma practice. The caring that is shared between husband and wife is a kind of respect for life, a cherishing of life. Starting with this feeling of caring and loving, one should gradually extend it to the surrounding environment. In a story I have previously mentioned, there is a couple who is deeply in love. They have great love and respect each other. Because they have so much love for each other, even when the husband comes out to water flowers in the garden, he is emanating joy, and caring for the flowers with love. This is an example of how one can extend love and caring to a wider surrounding. One thing that is important and that we cannot do without is giving our mind some rest. We need to bring peace and joy to our mind. When we make time to meditate or to do certain practices, it is for this reason. We are training our mind in bringing peace, rest and relaxation. Otherwise, our mind cannot rest; it cannot find peace. It is too distracted, too turbulent. It is as if it were ill, as if our mind had a fever or a cold. Without deliberate rest and relaxation, our mind does not act in a peaceful manner. Therefore, training our mind to bring about peace and rest is very important. [HHK] Usually, we get lots of pressure from our work and from our families. We think we have to do this, we have to do that. We are overwhelmed by work. There is so much we think we have to do. So in order to get some relief from the pressure, we turn to Dharma centers, but then we find lots of things to do there - maybe more pressure. And if you do not do well, the lama says you have broken samaya. [HHK] So they also become a source of pressure. What we need to do with our practice is to use it to find inner peace, not outside peace, inner peace. We can use our practice to make a place where our minds can be peaceful. So our minds have a sanctuary, like a happy home. Because this reason, we have to make some time every day to let our mind relax. Maybe it’s a good idea is to recite for ten minutes – recite? [HHK] Oh, not reciting. Rest for ten, twenty, fifteen, thirteen – ok ten minutes every three hours. Please. [Translator] We must leave a little bit of time to ourselves in order to rest. [Translator] Also, our mind is very distracted and so it has to have some place to come back home to. If we are wandering around, then we need to have a home to return to in order to relax and rest. Therefore, we need to find a certain peace, a certain kind of relaxed joy in our mind. In order to do that, it is best if we can find a way to meditate, to concentrate or focus our mind on something. But even if you do not have much time or energy to focus your mind, then let your mind relax without too much hope and fear. Do not let your mind wander into the past or worry about the future, but let it relax in the present moment. In this way, you can find peace and ease in your mind. This is an anecdote that I have already recounted, but maybe I can tell it again. There was a king who built a new palace. However, he had many valuable items stored in his old palace. He wanted to bring all of these items into his new palace overnight but he was reluctant to entrust this task to just anyone for he feared having his valuables stolen. There was only one minister in whom he could trust. He told this minister, “If you are able to bring everything that is in my old palace to the new one in one night, then I will supply you with all of the things you will need for the rest of your life, like money, properties, servants…everything.” So the minister worked very hard day and night, and in the end he was able to shift everything from the king’s old palace to the new one. The king was very happy and he gave him everything that he needed. The minister then went home, very tired but completely satisfied. He fell down in his bed and relaxed. We need to find this kind of relaxation, one that rewards us after we have achieved something. It is important to relax. Generally, people find it difficult to be totally satisfied and so finding relaxation does not come easily. However, we have many things: we have enough food to eat and clothing to wear; we have accomplished many positive things. For instance, we are here gathered from all over the world. This is itself an achievement. We have accomplished something. Fifty or sixty years ago, this would not have been possible, but now it is. Therefore, we should feel some satisfaction. We can then be able to relax and rest our minds. After the teaching, however if you all go and just fall down in your beds, people may ask, “Are you sick? What’s happening?” And then if you reply, “Oh, the Karmapa gave me the idea to rest,” that is not the case. So please, do not say that. Therefore, in attaining that sense of satisfaction and finding peace and relaxation, your mind plays an important role. You must start with a determination to practice. Next, you need to focus on the specific task you are performing and let go of everything else in your mind. Let go of the past, the present, and the future. Let go of all thoughts and focus solely on your current task. As you can see, whether or not you truly achieve a peaceful, relaxed state depends on your mind. For example, in my personal case, I do not have much time these days to engage in formal practice and meditation. However, when I was asked to do practices or prayers by others, at that moment, I fully concentrate on what I am doing and let everything else go. I do not let anything else come into my mind. This is very important. In the mahamudra, for instance, we talk a lot about - Ye-Lan-Mi-Shie [in Tibetan] --- which means letting go of the mind. Ye-Lan-Mi-Shie means having freedom from concepts or thoughts. It is important to make a clear aspiration that “I will do this and nothing else.” When you do this, you will be able to relax and find peace. One significant obstacle to finding peace of mind is attachment or clinging. When one is strongly attached to something, it is difficult to separate one’s mind from that. Thus, it becomes a formidable obstacle to one’s peace of mind. Take anger, for instance. It is sometimes with us, but not always. When we’re angry or when certain very strong anger or hatred comes up, then it is disturbing. But it does not always come. Attachment, on the other hand, is something which is more consistently present. Therefore, it is something that is not easy to separate from ourselves. It disturbs our peace of mind. There is a Tibetan saying that applies to the relationship we have with our attachment. It involves a desirable cup that burns to the touch. If you try to hold a burning cup, it will injure your hand. However, if you don’t hold it, then it will fall to the ground and break. You desperately want to drop the cup because it is burning your hand, yet you cannot let it go without causing it to break. This is how we feel about the object of our attachment: you get it but it hurts you. But then when you want to let go of it, and you are not able to. How does attachment and clinging arise? When we are attached to something, we tend to see only its positive side. We don’t acknowledge any negative qualities. We focus only on the good. Therefore, when we are attached to something, the goodness of the object and our mind cannot be separated. They become one. When the object of our attachment appears in our mind, it appears as something completely positive. Unless it appears in this way, the object does not appear in our mind. So therefore, the goodness of the object of our attachment along with its appearance comes together. The object of our attachment is seen as a very desirable thing. The sole reason is that we like it; it is desirable to our mind. Because of this, it is something from which we cannot bear to be separated. You can see that attachment or craving takes away our freedom, it dominates us. People try to create things that are desirable to others. When someone wants to sell us something, they try to find out which objects will attract our mind most effectively. What are the things that will create such a strong desire in us that we fail to be concerned about the cost? When such objects are created, our mind has such a strong craving for it that we cannot resist. It does not matter how much we spend. The main point is that we become overpowered by our attachment to that object and, in the process, we lose our freedom to choose whether or not we want it. Our mind is totally taken over by that object. This is important to understand. When I was young, I was taken to China. Sometimes the people would take me out shopping. They would take me to the shops where there were nice dolls and other such toys to play with. There were so many fine and interesting things, but, of course, we could not buy everything. I discovered that if you give over to your attachment or to desire completely, then it can lead you to steal because you simply cannot buy everything. Now of course, I understand that some people steal out of necessity, but it is also possible to resort to stealing because of too much desire; there are too many nice things. Thus, when thoughts of our object of attachment come to mind, they are imbued with desire and positive qualities. Of course, there are some objects which are more desirous than others, but basically what is deemed desirable and undesirable has much to do with our own mind. We create the desirability. For instance, if everyone claims a particular object is positive, then we, as a collective identity, identify that as something desirable, something good. Therefore, the desirability and undesirability is something that we, as a society, create. This is also important to understand. Consequently, that which makes our mind attracted to things, and thus captive to it, becomes the attachment. When we are overpowered by attachment, we lose our freedom. That also feeds in to the way we see and how we think. It is not that the object creates the attachment; it is our mind, how we react to that object. It is our mind that relinquishes our freedom. Our view of the object of attachment is not completely accurate. Our mind, overpowered by too much attraction or desire, overvalues the quality of that object. For instance, take a diamond. These days there are many fake diamonds. If someone were to make a fake diamond that looks like the real thing, then I may mistake it. Consequently, my perception of this fake diamond as a real one is incorrect. The desire I have for it is based on a misconception. [Translator] Yes, one hundred percent. Therefore, the objects that I am attached to, I see as one hundred percent good, although in actuality that is not the case. I am seeing it as one hundred percent desirable when in fact is not one hundred percent desirable at all. For that reason, there remains a difference between the way an object is and the way our mind perceives it. You might say, then, that your loving kindness, your compassion for others, is also comprised of desire. Therefore, is that not attachment? Your mind does not wish to let go of the compassion you have for these beings. However, the difference lies in the fact that attachment’s sole motivation is the desire to have something. The desire becomes so strong that you lose any sense of control over your mind; you lose your freedom to choose. But when we have compassion and love for other beings, our intention is not to forsake them, not to let them go. Maybe they have been very kind to us. The motivation is genuine. The choice is yours to make. As opposed to the captivity inherent in desiring something, you have the freedom to choose to like these people, to have compassion for these people. You don’t want to give up on them. Therefore, the difference between not giving up on sentient beings out of loving kindness and not giving up our attachment to an object is that attachment comes with feelings of grasping, limitations, and captivity. You do not have control and you cannot let go. But in compassion and loving kindness, it is more open and free. There is a warm feeling in connection with this, as opposed to a feeling of limitation and confinement. This is very different. Most of you are householders and so you often face this challenge of attachment. But when we say that attachment is something negative, it is not to say that desirable object or every kind of attachment is negative. You do not have to give up everything that you are attached to. Some people think that they have to give up everything in order to dispel all attachment, but that is incorrect. That is not what I am saying. What you have to do is to gage your relationships and your attachments on the right reasons, on the right motivation. When attachment becomes unreasonable, unclear, and limiting, then the outcome is pain and suffering later on. That is not what you want. Sometimes you get into something, like a relationship, without proper understanding or proper motivation and it becomes very difficult to get out of it. This creates many problems for everybody, on both sides. Therefore, if you look deeply and if you can understand it, you can find a good reason. If your motivation is clear, then you can develop relationships in a very positive way, bringing harmony and benefit rather than harm. Therefore, it is not to say that you cannot have any attachments, that you cannot talk with others, or that you have to sit in meditation all of the time. That is not the case. Relationships, whether they are with family or others, should not become a source of suffering, a source of problems. They should instead be a source of happiness. Thus, we have to see it and understand it in a certain way. The essential thing is our attitude towards our relationships, how we perceive them. That becomes very important. And if it is done with the proper motivation, then it does not need to be a source of suffering. WHAT IS THE PROPER WAY? This shows the difference between thinking about things on a surface level versus finding the deeper, more profound meaning through meditation and contemplation. Therefore, one does not always have to take what is said or what is written solely at face value. I will now go through some of the questions that were sent to me this morning. 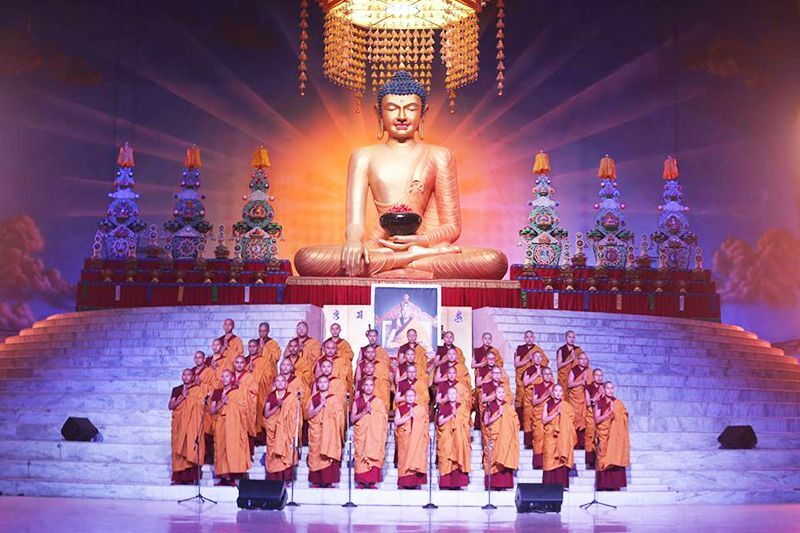 Q: His Holiness speaks often of the importance of blending our life and the Dharma. Having not heard His Holiness speak about his views on the importance or balance of formal practice and retreat versus carrying these practices or understandings to daily life, something that His Holiness thinks are not so important these days, meaning formal practice and retreat, etc. Could His Holiness please speak about his views about the importance of or lack of formal practice retreat of various lengths? A: Whenever someone comes to see me, they always complain, saying, “I don’t have time to practice. What can I do?” Because of this, I suggested in my teaching that even if you don’t have time, you can still practice. That should not completely hinder you from doing some practice. But I never said that you should not practice formally. Of course if you can practice formally, that is very good. If you can go on retreat, that is also very good. But when you do go on retreat, I feel that the retreat is something you do when you really want to find the inner peace, where your body, speech, and mind can rest in solitude. With the motivation to seek out solitude and to find peace of mind, you go on retreat. That is a true retreat. But if your mind is totally distracted when you place your body in retreat, then it is unclear whether or not you are really on retreat; it is actually more like a prison. You put your body in a situation where it cannot move, but your mind wants to. However, if your body, speech, and mind are truly inspired to find solitude when you do the retreat, then it will not be difficult for you. You are there because you truly wish to be there, you have the right attitude, the right aspiration. Thus, your retreat is successful. I very much encourage people to do this kind of retreat. Then again, people sometimes do retreats in a very traditional way. You might think because some people complete three year retreats, I had to do a three year retreat also. However, the retreat has to be done in a proper way. It has to be inspired by true practice, not done just as a tradition because other people are doing one, two, and three year retreats. Otherwise, if you are just following tradition, then after one or two years, you may become fed up with the retreat. Then it will not be so useful. So if you find time and you have the right attitude and the right motivation to go on retreat and do formal practices, that is good. I very much encourage you to do that. On the other hand, when people say that they do not have time to practice, I believe that is also fine. When they say this, I know that they are interested in doing practice. They feel bad because they do not have time to practice. Their interest is something positive. They feel the need to practice, but they cannot find the time. They seek to find a way to practice. Actually, I very much appreciate that too. Q: So the next question is: Your Holiness, most people experience many problems with attachment. Can you give some guidance on how, as householders, one can have love and patience in a relationship without attachment? A: We have two hands. However, with one hand maybe you have to meditate and with the other, you need to shake hands with someone. That may be possible, or it may not be. The main thing is when you practice Dharma, wisdom and compassion both have to be present. Wisdom and compassion are the essential points. Therefore, when we talk about wisdom, being able to think and examine, not only from one side, but from all sides, we have to understand - we truly have to examine. In our lives, these two cannot be separated. We must have compassion, love, and we also must have wisdom. When we talk about what is necessary and what is not necessary or what we must give up or what we should take on, these things are decided by wisdom. So when we talk about wisdom, it is not something that we have to study a great deal. It is not like that. We have to understand what is beneficial, what leads us to positive effects and what leads us to suffering and negative effects. We have to understand how to distinguish these. We then need to abandon the things that result in problems and suffering, and take on those that bring about happiness and benefit. Therefore, the understanding is that when we look at something, it is not one hundred percent good or one hundred percent bad. We need to see things in a clear way. And through that wisdom, united with compassion, we then need to work on it. That is the main point. Today, we will stop here and recite the Sanskrit portion of the dedication.